Hydrangea at Meigetsuin temple in Kamakura | Why don't you go on a trip to Japan? Kamakura city is in Kanagawa prefecture and it is one of the famous sightseeing spot known as a historical place. Kamakura was the government seat for the Kamakura bakufu between the 12th to 14th centuries. Bakufu refers to the military government existed in Japan. 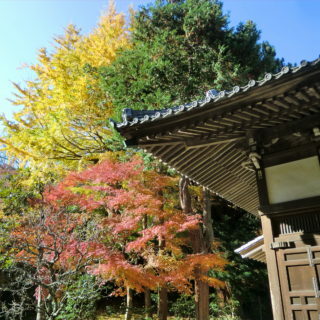 The area has some national treasures and some old temples and shrines built in era of Kamakura reminds. 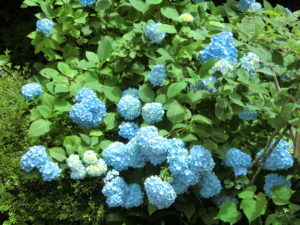 I went to Kamakura in June to see hydrangea flowers. I’ve been there for several times because I live in Kanagawa Prefecture. It takes about one hour by train. But this was the first time to go there for watching hydrangea purpose. First, I got off a train at Kitakamakura station the JR Yokosuka Line. (It takes 57 minutes from Tokyo St. to Kitakamakura St. \799) That day was a perfect day for sightseeing even though it was in the rainy season. The first visit place is Meigetsuin temple. 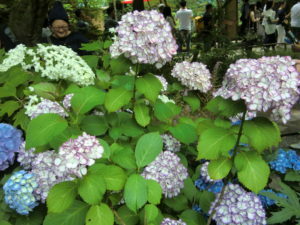 Meigetsuin temple is well known as hydrangea temple, so it should be crowded in the rainy season. Passing through Engakuji temple, I found many people going to the same direction and they were sure to go to Meigetsuin temple. After arriving in front of the temple, I paid entrance fee \500, then I found great hydrangea flowers. Tremendous numbers of flowers are filled in that temple’s garden. You can find hydrangea flowers in another area of Kamakura but it is said Meigetsuin’s hydrangea is the best. As the temple is called “Meigetsuin Blue”, the flower’s color is mainly blue. Keeping go up the stairs, there was a main hall. There are as many visitors as flowers! Many people stopped taking pictures on the passage so it was hard to going on to smoothly. In the back of the main hall there is a garden and you can see seasonal flowers through the year. 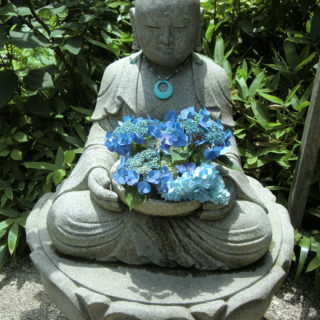 Why there are many hydrangea flowers in Kamakura? One of the reasons for choosing the Shogunate at Kamakura in the middle century is land. Kamakura is surrounded by mountains and sea which is less susceptible to attack from enemies. 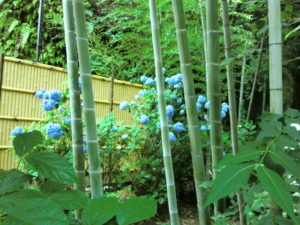 In order to prevent the landslide in the rain in the slope of the mountain, hydrangea flowers were planted at that time. The roots of hydrangea are very strong and grow fast to extend into the soil. It is wisdom of the people at the time.